I absolutely love weekends and I think it is safe to say that you do too! I love my job, but it is so nice to have the weekends and just have two days where I can relax and do whatever I want. You feel? It is always nice to have time to relax, binge watch shows on Netflix, and catch up with friends and family. Now that I am not in college anymore, I don't see my best friends on a weekly basis. We are all so busy and even though we constantly communicate with each other, it isn't the same as being together face-to-face. Sometimes, you just need your girls and the perfect way to get everyone together is by having a girls night! Want to plan a girls night? 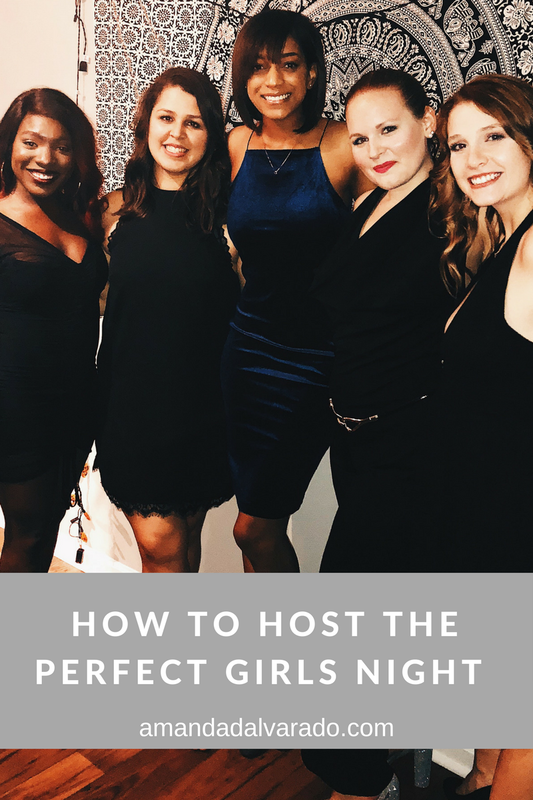 I have some tips on how to host the perfect girls night! I mean, you could throw something together in a couple hours, but if you're like me, you need a game plan and time to execute! I'm also a perfectionist, so throwing something together on a time crunch stressed me out more than anything. I love a good theme. Whether you create a theme around a show or movie, colors, event - having a theme really helps you narrow down what you'll need. It helps you get an idea of how you want your girls night to go! You can have a fancy dinner party, pajama party, award show viewing, wine tasting, etc. Got your theme? Now, it's time to figure out decorations, supplies, food, drinks, activities. This is the fun stuff! Sure, you can send out a group text OR you could do something cuter! You could use a site like Evite and send them out! There are so many designs and there is probably one that even matches the theme or aesthetic of the night! Evites are great because your friends can RSVP right on the invitation and you'll get a notification! Not into that? Make a private event on Facebook and invite your friends to it! Make sure you have all the info that they'll need like what to wear or if they need to bring anything! You're going to need to pick up important items like food, drinks, decorations, and other supplies. What you need all depends on what kind of girls night you're having and your theme. Decorations can really add to the night. Having a theme is so important because it will help you decide on decor for your night! Also, food and drinks are super important! You can have everyone bring a dish and host a potluck or do a DIY food bar! Make sure you've got plenty of drinks - water, soda, juice. If you're of age, wine is a great touch or create a special cocktail for the night. One of my favorite parts of a girls' night is prepping the space. You don't have to go crazy with the decor! You can just add a few light touches.. fresh flowers, extra pillows and blankets. Have fun with this! When the time comes, enjoy yourself! You planned an awesome girls night in and now it is time to enjoy yourself and your besties. This is the time to catch up, laugh, be silly, and do whatever it is you all enjoy. I can't wait to get my gal pals together and have a little girls night in! I love party and event planning, so hosting things like girls nights are right up my alley! What are some fun girls night themes? Comment your ideas below!